The sun is shining, my husband is no longer a student, and tonight I get to watch him graduate! It's a good (and oh so busy) day! 1. Last night was my first time wearing a dress & having painted toenails since I became a mom 6 and a half months ago. It's amazing what some bling, nail polish, and heels can do for your confidence! :) Thanks Jenn for styling my outfit! 2. I am SO thankful for all of my readers and followers. Your comments, emails, and just the fact that you read my blog encourages me so much! So thank YOU! 3. If you are a Wordpress blogger, you can follow me through GFC (with a Google account, Twitter, or Yahoo) or through Feedburner. You look STUNNING! There is no way you had a baby 6 months ago.. seriously. Ummmm....I love your dress! You look so pretty! Hope you had a wonderful time celebrating with your hubby tonight! Hey there! Visiting from TLM! 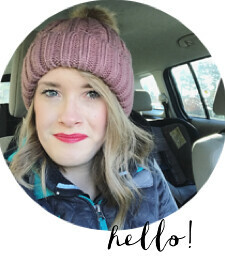 Been reading your blog for a little while now and I just wanted to drop in and tell you how lovely you are! I love reading your blog and you just look fabulous in your pretty dress! Congrats to your hubby! You look beautiful, Mackenzie! I love that dress.